We've been making our Flower Essences for nearly 30 years and it's our pleasure to share them with you. Here you find out more about Flower & Vibrational Essences and how they can help you, and explore our wonderful range of handmade Essences. 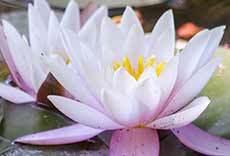 What Are Flower & Vibrational Essences and How Can They Help? 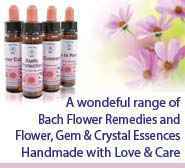 We offer a unique range of handmade Bach Flower Remedies and Flower, Gem & Crystal Essences. Bach Flower Remedies and Flower, Gem & Crystal Essences are simple and natural tools that everyone can use and benefit from. The positive natural energies that these Essences contain promote harmony, balance and wholeness through all levels of your being. Flower & Vibrational Essences are wonderful tools for personal & spiritual growth, helping you to release difficult emotions and thought patterns, transcend your limitations & discover your true potential. You can explore the individual Essence ranges that we offer, use our Essence selector or find out more about Flower & Crystal Essences here. You can also find lots of information and resources in the links below and throughout our site. If you need any help or advice, please contact us, we're here to help! From the gentle acting Bach Flower Remedies to deeper acting Flower, Gem & Crystal Essences & Combinations, we have a wonderful range of Essences to choose from. You can explore our full range of Essences and order online or call us on 01379 608059 (++44 1379 608059) to order or talk to us for some free expert help & advice. The Bach Flower Remedies are a wonderful set of Essences that can be used to help you to achieve greater balance and harmony in your life. Created by Dr Edward Bach in the 1930s there are 38 Bach Remedies, each containing a unique, positive vibration taken from a flower, tree or plant. The Bach Remedies are often a really good starting point on your journey as they are simple and easy to use and help you to balance how you are thinking and feeling in the moment. We offer all 38 remedies, plus sets/ kits, books and charts along with lots of information about the remedies and the philosophy behind them. Beyond the Bach Flowers, we offer an extensive range of other deeper acting Essences. These Flower, Gem & Crystal Essences work at a deep level to help you to feel and release the old layers of buried emotions and thought patterns that unconsciously create who you are and how you react to situations and people in your life. We have both single and combination essences to choose from, each with their own specific and unique focus. Discover more about Essences, how they work, how they can help you and also about the different Essence types. Our Essence Review for March is for the Restoring Patience combination from our Divine Harmony Essence range. This powerful Essence helps to dissolve vibrations of impatience, frustration & irritability, encouraging greater stillness and the ability to be in the now. As we transcend our old polarities, we will inevitably come up against some of our deeply held old belief systems. So, here are some essence suggestions to help you dismantle any ‘road blocks’ and move beyond these old patterns. Vibrational Essences (Flower & Gem Essences) are part of the Vibrational Medicine family. Their use is rooted in a tradition that recognises unity as a fundamental truth of life. Therefore their use encourages a process of inner growth and transformation that can help you to awaken to a new understanding of yourself. The philosophy behind Essences and why and how they work is a fascinating and interesting field. Crystal Herbs is run by Catherine Keattch and Sam Cremnitz, along with a dedicated team who are all trained practitioners and healers in their own right. 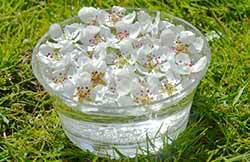 We are a specialist Flower Essence producer and we're passionate about all aspects of Vibrational Essences. We have been making and selling our range of Essences for nearly 30 years and have customers all over the world. All of our essences are handmade with love & care and are preserved in organic brandy, and alongside the Essences that we offer we also provide help, support and information about vibrational Essences. We are based in the Norfolk in the U.K. and send our Essences to individuals, practitioners, shops and distributors all around the world. BAFEP is the trade association for the Essence community in the U.K. and around the world. It advises on best practice and the standards of production, labelling and advertising in accordance with U.K. legal guidelines. We are also a Friend of the British Flower & Vibrational Essences Association. 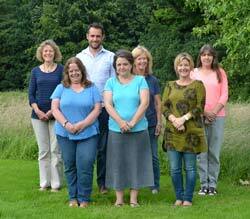 The BFVEA is a professional organisation whose membership consists of practitioners and tutors of flower essence therapy.